Sixth grade students at Greenview Upper Elementary School recently had the special opportunity to work with local artist Christine Uveges of Eikona Studios in Cleveland. A graduate of Brush High School, Ms. Uveges, along with Greenview Art Specialist Susan Foley, provided artistic direction to help the sixth graders create bright, colorful banners for their art projects. 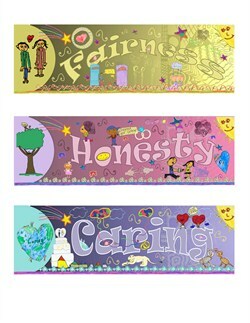 Each of the six banners exemplifies specific character traits emphasized at Greenview, including honesty, caring, and respect. The banners will be prominently displayed on the outside of the school building. This year marked the second residency at Greenview for Ms. Uveges, which is generously funded by the Greenview PTA. Ms. Uveges is a principal at Eikona Studios, which specializes in renovation and design for churches, halls, and other public spaces. The local studio has been recognized three times by the Ohio Arts Council for Excellence in Design and Traditional Art. The SEL Schools wish to thank Ms. Uveges for providing her talented expertise, and congratulate the sixth grade students at Greenview Upper Elementary for creating such impressive works of art!